Last night after dinner, as the sun started to go down, my best friend and I strapped on some helmets and sped off on our trusty cycles. We zoomed down the streets of our neighborhood, racing the daylight and each other, to the soundtrack of a thousand cicadas buzzing in the trees. We made a lap around the playground, but decided not to stop and play with the other kids, instead zipping off in search of another downhill to give us a dose of speed. 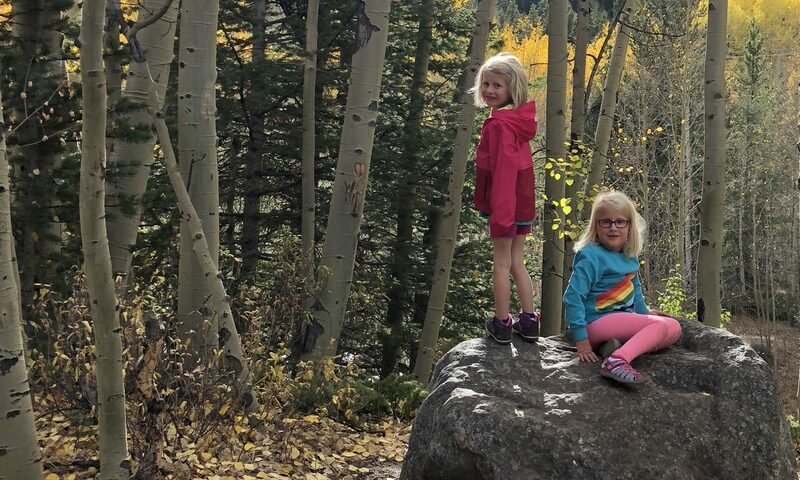 As I flew down the hills, as much wind as the humid Southern summer air can muster in my face, I caught myself smiling wide, tongue half-out like an eight-year-old. In my mind, I was popping wheelies, if not in reality. We perched at the top of a hill, wondering if the bright light streaking across the darkening sky was an asteroid or an airplane, and we marveled at the giant pink-tinged moon hanging over a shining state capitol building, smiling down on our city with its chubby old man face. When we pulled up to our driveway, I half expected my mom to tell us to hurry up and get bathed before bedtime– tomorrow’s a school day. It was a wonderful way to spend an evening. It was also a wonderful twist to a bad situation. On Friday night, after an all-ages dance party with friends and their children (complete with glow-sticks), we came home and, as usual, I opened the back door to let the dogs out into our fenced back yard. Ten minutes later, a neighbor knocked at the door, Bessie collared in one hand, Olive running across the street. “How the heck did they get out of the fenced yard?” Olive’s a runner, but it’s usually because she’s slipped past us at the front door. We captured her and went to check out the back yard. The alley gate was open. Neither one of us had been out the back gate, so we knew someone had been IN. That’s when we noticed my bike was missing. Let me tell you, I loved that bike. It wasn’t fast, and it often wasn’t functional, but I loved it. 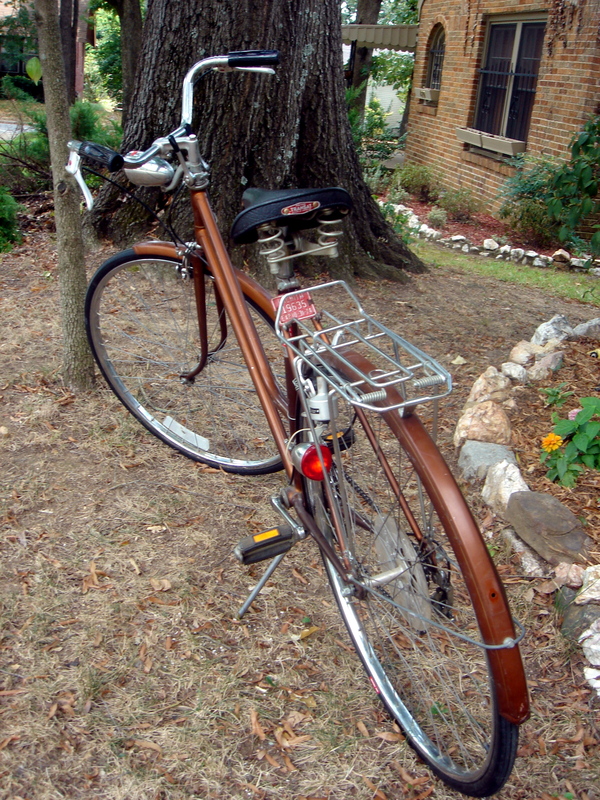 It was a petite black Parkwood (I thought the name was special because we used to live on a street named Parkwood) with silver fenders and a silver basket on the front, and we bought it off of Craigslist. It had a sticker that bragged it was Made in the USA, and it was so heavy it must have been forged out of pure American iron. It was mine. I try to have a hands-off attitude toward my stuff. I want to be the kind of person who would give my bike up to anyone who asked me for it. 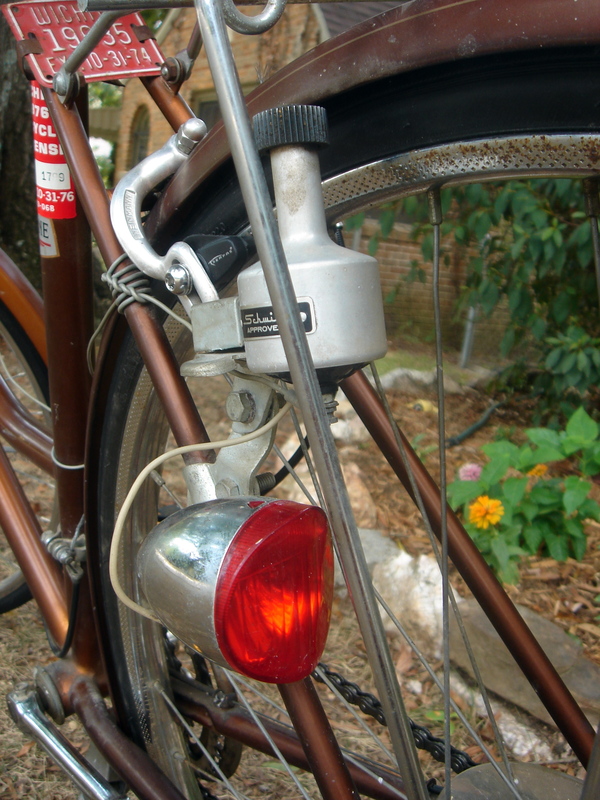 And, though I loved it, the loss of the bike didn’t bother me nearly as much as the feeling of violation, that someone had come into my back yard to take my things, and the fear and worry that one of my dogs could have been killed or hurt because the thief left the back gate open. Because I like to bike to my church, I wanted a replacement bicycle. 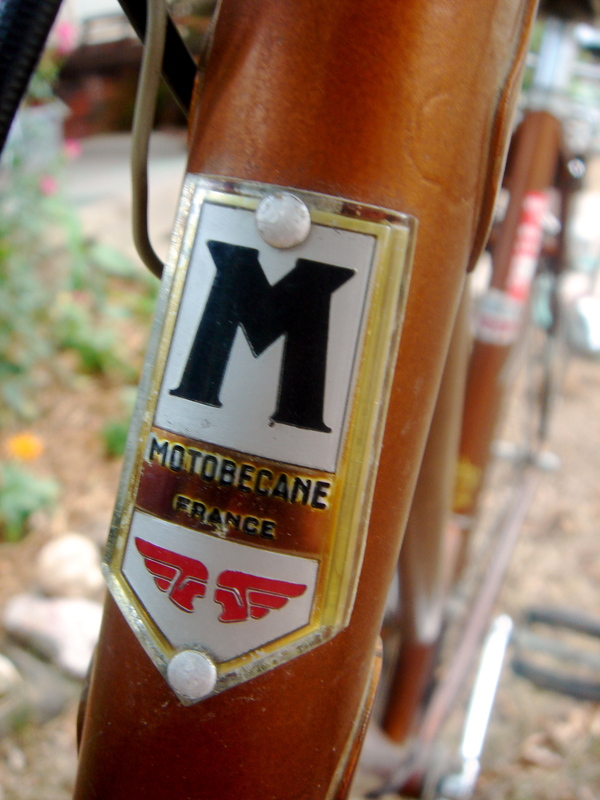 I started browsing Craigslist the next morning and found a listing for two matching, vintage French town bicycles, specifically 1974 Motobecane Nobly bicycles. The seller lived so close to us I could have biked there had I had a bicycle, and Jon and I went to scope them out. Just to see other options, we went to a bike store and I tested a cute little hybrid that rode like a dream and shifted gears with the click of a button. Less cute was the $400 price tag, though, so we left without making the purchase and went to see the Craigslist find. 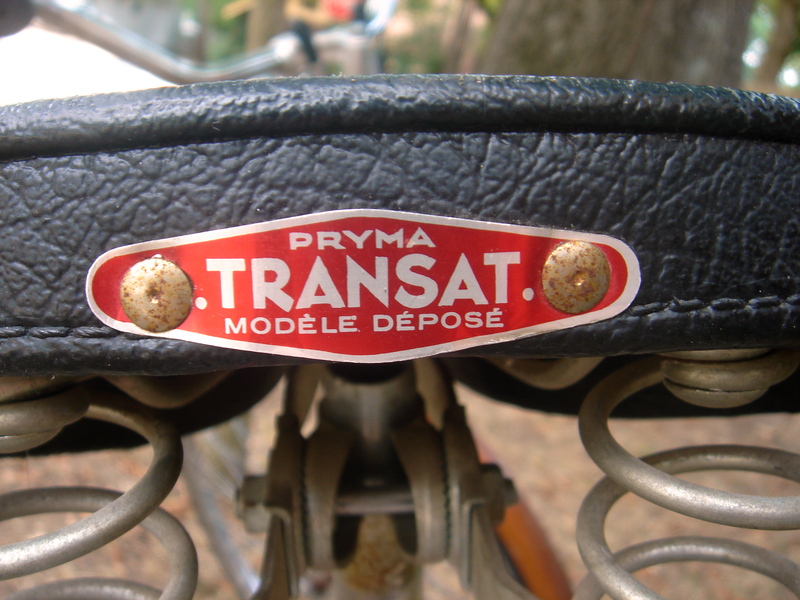 When we saw the vintage French bikes, we knew we had to have them, and $200 later, we were on our way home with our beauties. 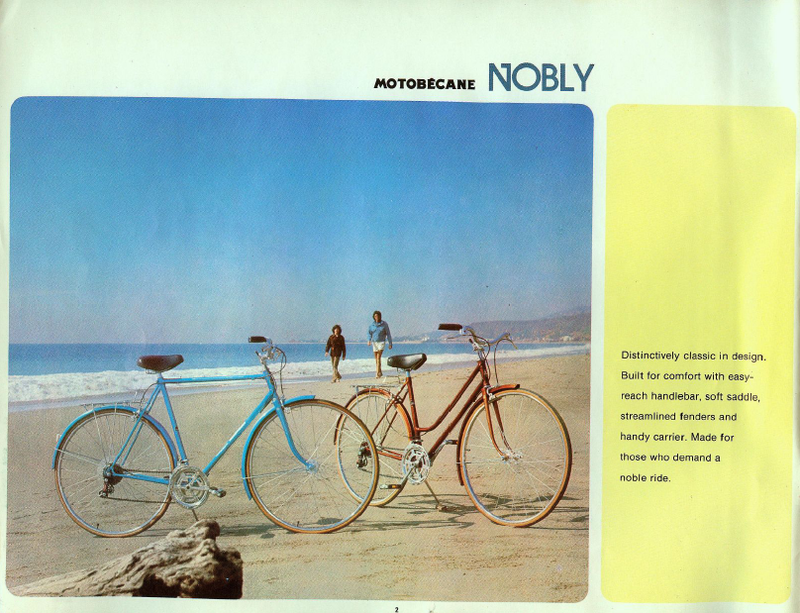 I found a .pdf of the 1974 Motobecane catalog online. 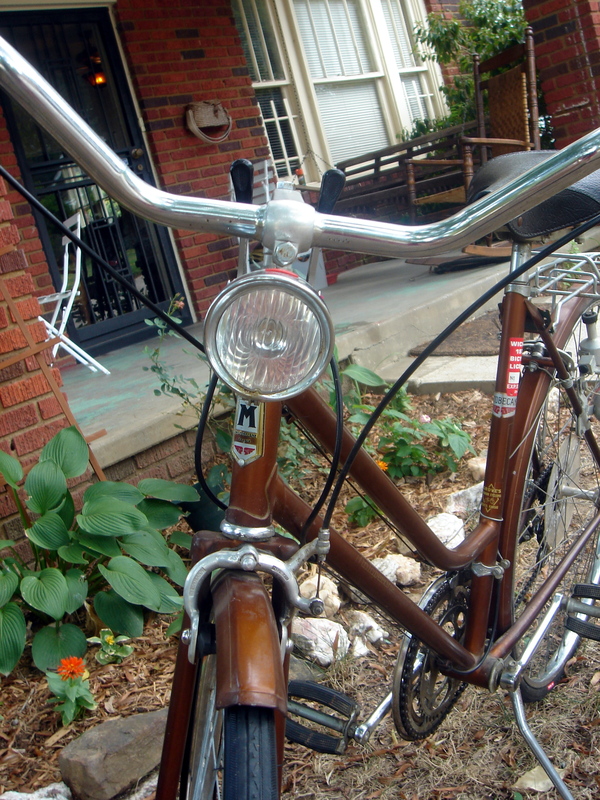 The bike in the background looks identical to my new bike, except mine has groovy lights on it. 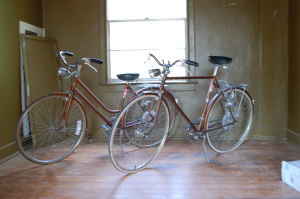 The Craigslist image of our "new" bikes. And they are beauties. They’re painted a lovely copper color, and though the chrome was a little rusty, they polished up nice. 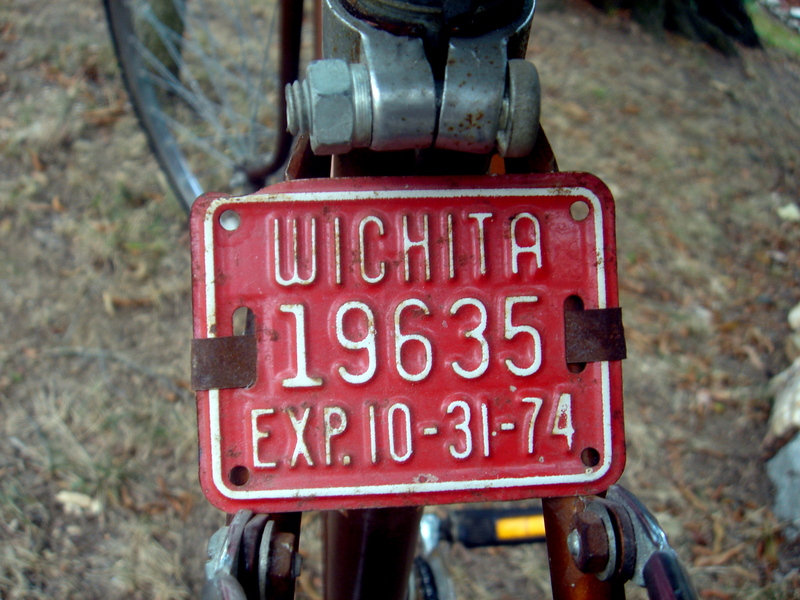 They have fenders and racks on the backs, still sport 1974 bicycle license plates from Wichita, Kansas, and my favorite features are the working head and tail lights operated with a friction generator activated as the bikes are pedaled. They’re a sort of bike you don’t see very often in a world that seems divided among road bikes, cruisers, and mountain bikes/mountain bike wannabes– they’re basically city commuter bikes, more upright than the average road bike and outfitted with a cruiser’s fenders and racks, on skinny road bike tires, with apparently unusual 27 inch wheels. Isn't that headlight the cutest? 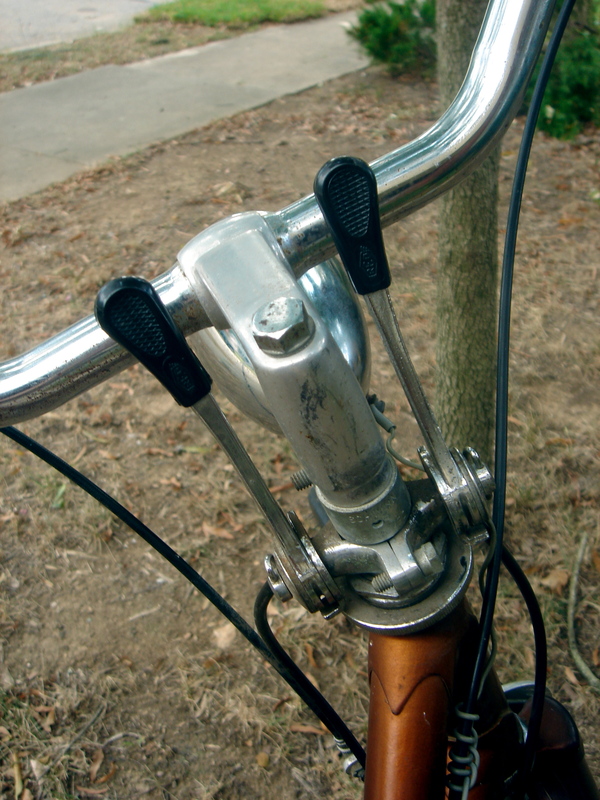 These crazy levers are how you shift the gears. Looks like my plate's expired. I like that the seat says "sat." This is the mechanism that powers the lights. As the wheel turns, the little wheel turns and generates the power. So cool! Why don't "real" bikes have these? Beyond the rust, the tires were dryrotted, the gears weren’t shifting, and the brakes were sketchy. My best friend/biking buddy/bunkmate Jon happens to be pretty handy with bikes, and by last evening had my bike newly shod in fresh tires and tubes, tuned up to the point that 4/10 gears (activated with levers at the center of the handlebars) are now working, and had the brakes mostly fixed. His Motobecane is still not up and running (the rear gears seem fully locked up and won’t move a bit when he pedals), but he hopped on his trusty day-to-day bike and joined me for our joyride. My new bike turned out to be much lighter and faster than my last bike and was a downright thrill to ride in comparison. Jon said he had trouble keeping up, and in truth, I left him in the dust a few times. He says he can’t wait to have his speedy new old bike fully operational so he can give me a run for my money. Maybe his will look as snazzy as this fully restored version. I may never be Lance Armstrong, as I’m not particularly interested in cycling long distances, but I’m more than excited to have a time machine to transport me back to my childhood for evening jaunts around the neighborhood. Maybe after that we can catch fireflies in a mason jar. i’m so sorry about your old bike. maybe they really needed it. at least they could have shut the gate though. :( we love riding our bikes around for a date. i hope the weather cools off soon so we can do it more. Sorry to hear about your old bike, but now you have a better one! You’re having so much fun, your post reminded me of a few childhood past times I’d like to try again. It is a pity about your old bike, but we got a saying that goes something like “It’s good luck accompanying bad luck” – if your old one hadn’t been stolen you’d never have gotten such beautiful new bikes! I love the way you’re excited on the dynamo though – just beware it often doesn’t work when it rains and you’ll have to pedal WAY harder when they’re on ;). But either way – enjoy the rides!